Before you understand why hardwood floor refinishing not always appropriate for your project, I want to say a few words about some types of hardwood and its coverage, and then we will talk about the method of upgrading the floor surface. So, there are two types of hardwood surfaces – unfinished and prefinished. On prefinished surfaces, manufacturers put a few layers of varnish on at the factory and it is ready for installation. Due to the fact that hardwood is made of different kinds of wood, it will have a different texture and color. Often, to diversify the colors of the same type of wood, manufacturers use different stains before they apply the first coat of varnish. Overall, the prefinished hardwood has up to seven layers of lacquer. There are also several types of hardwood, such as solid wood or engineered. Solid wood is made entirely of one species of wood, and the engineer hardwood has several layers of plywood, wood fiber and other layers, the upper of which is a natural layer of the wood. Typically, a layer of wood has a thickness between 1/8 of an inch and ¼ of an inch. If you install engineered floor in the house, and you want to update it, the first thing you need to do – figure out the thickness of real wood on the boards and then make a decision. If you got this floor from a previous owner, he should keep a few hardwood boards after installation. You will need to just simply to find. In any case, you need an expert who will tell all about the features of your floor. 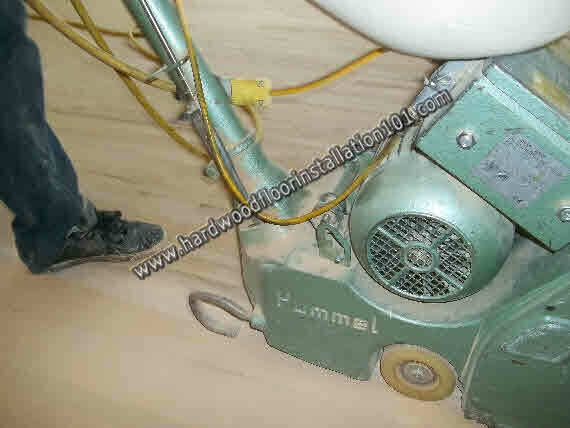 This specialist may be a professional floor installer, but the most professional advice you can get directly from a person who is engaged hardwood floor refinishing – floor sander. If your house has a solid wood, which boards are made from a solid piece of wood, then you are lucky and you can safely start refinishing, after which your floor will receive a new life. Shortage is particularly acute with engineer hardwood floor, which is made artificially from multiple heterogeneous layers, the upper of which is wood. As I mentioned, the thickness of its upper layer may be 1 / 8 – ¼ inch. 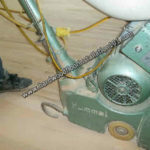 This brings us to the most important question can you do hardwood floor refinishing, if it is an engineer hardwood? As you may have guessed, to make hardwood floor refinishing, thickness of natural wood plays the most important role. If your installed hardwood has a top layer of 1 / 8 inch, you can not make its refinishing because hardwood floor refinisher will cut this thickness of wood during this process. If your engineer hardwood has a thickness of natural wood ¼ inch, then you have the opportunity to make its refinishing only once. Perhaps the previous owner had already done these updates, but how can you know? On this very old pieces of floor can “tell” you. Just look at in the joints baseboards and hardwood. As you can see, hardwood floor refinishing is not always good for upgrading of your floor. Knowing these simple things, you can protect yourself from large and sometimes not very reasonable investment. On other pages of this website you’ll find more great tips on hardwood floor refinishing.